When a friend first gave me a jar of lovingly made preserved lemons over 15 years ago, I didn’t have a clue how to use them. Now they’re a constant in my pantry, to add zest to a variety of dishes. They’re easy to make, perfect to use up a lemon glut and – if stored correctly – will last for months. Sterilise some glass jars with lids, in the oven or dishwasher. Jars with a wide top are easiest to use. Take a lemon, leaving the top fifth of the fruit uncut, and cut into quarters. Prise the lemon open without breaking it and liberally stuff salt into the middle. Push into the bottom of the jar and repeat until full. Add 5 – 6 black peppercorns and a stick or two of cassia or cinnamon. Really wedge the fruit in and cram as many lemons into the jar as possible. If using smaller jars, it’s ok to cut the lemons fully into quarters if necessary. Don’t forget to coat in salt. Fill the jars with lemon juice to cover the fruit. Gently knock the jar to release any bubbles. It can be useful to add a layer of oil, as extra protection to keep air out. Seal the jar and store in a cool, dark space (your pantry if you have one). It takes about 2 – 4 weeks for the lemons to preserve depending on the variety you use. Thin skin Meyer lemons take less time than thick-skinned varieties. It’s important the lemons remain covered at all times, so add more juice or oil if required. Use only the preserved skin, not pith or flesh. Use them straight from the jar, don’t rinse. Carefully peel back a thin layer of lemon skin and slice thinly. A little goes a long way, so if in doubt use a little and add more after tasting. 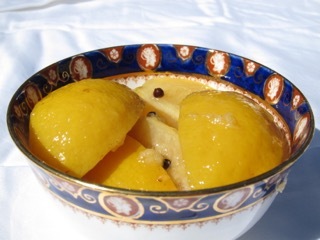 Preserved lemons are a traditional addition to a tagine (Moroccan style stew) but can be used in most savoury recipes that call for lemon zest for added zing. I like adding thin strips to sautéed zucchini ribbons (or zucchini, black olives, garlic and oil pasta or rice topping), stirring them through homemade hummus-style dips or in a salad with shaved fennel. This recipe is vegan, gluten-free, dairy-free and even paleo-friendly! For more original, healthy recipes sign up for the free newsletter and check out my recipe archive.